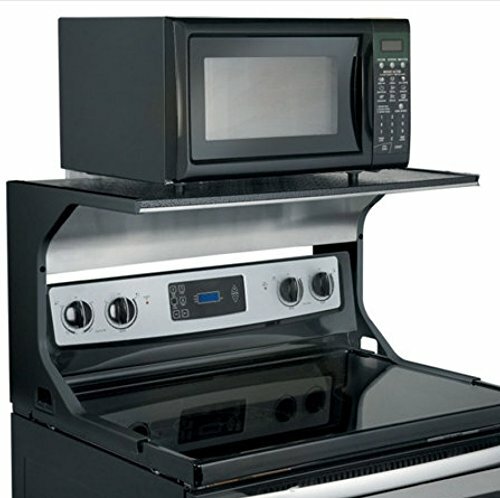 Even small microwave ovens take up valuable counter space, but now you can put that space to better use by getting that oven (or other space-hogging appliance) off the counter, and up above your free-standing range. This sturdy Microwave Oven Shelf Bracket also lets you save floor space by eliminating the need for a separate microwave cart. These are not the flimsy brackets you may have seen elsewhere; this textured enameled steel shelf holds up to 80 lbs., and has porcelain-finished side supports, and easy-to-clean stainless steel deflector underneath. The Microwave Oven Shelf Bracket fits 30"W ranges with a top spill retainer edge up to 7/8" wide. Hardware and instructions included. The shelf is 30"W x 18"D, and it sits 15" above the stove top. The Microwave Oven Shelf Bracket fits 30"W ranges with a top spill retainer edge up to 7/8" wide. The shelf is 30"W x 18"D, and it sits 15" above the stove top.